Campaign advisors said a goal of $150 million was realistic. But CELEBRATE 150: The Campaign for UNH dared to dream big and raised more than twice that from generous friends and alumni who shared a vision for the future of UNH. Two years after its public launch in September 2016 — and seven years after quietly getting underway in 2011 — CELEBRATE 150: The Campaign for UNH has become a milestone in UNH history. 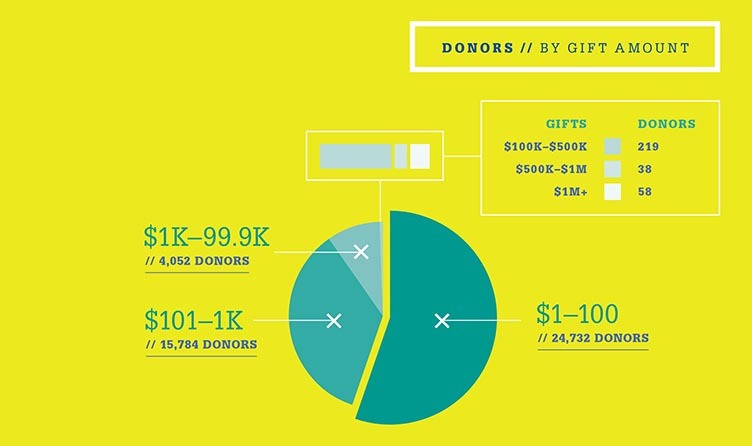 When the campaign closed on June 30, 2018, it had surpassed its $275 million goal by 12 percent, with nearly $308 million in outright gifts and pledges raised from almost 45,000 alumni, parents, faculty, staff, students and friends. The committee partnered with UNH’s advancement division and with consultants to determine the campaign’s scope and to set a goal, identifying five areas where additional funding would have the greatest impact at the university. The top priority was to raise new funds for need-based and merit scholarships that both attract academically talented undergraduates and allow any qualified student to attend UNH and graduate without incurring crippling debt. Another priority was to raise funds in support of academic and other programs that complement the classroom experience and prepare students for success after college. Because an outstanding faculty is at the core of our success as a national public research university, a third area of focus was support for endowed positions and other funding that can attract and retain talent and inspire innovation within UNH’s colleges, schools and centers. A fourth priority was funding new construction and thoughtful stewardship of existing buildings to meet the need for high-quality facilities on UNH campuses. A final priority was support for research and innovation at UNH, where every day, in keeping with our mission as a public research university, faculty and students pursue solutions at every scale for addressing the world’s greatest challenges. Another important objective of the campaign was to invite generations of Wildcats and other friends of UNH to partner in building the university’s future and to illustrate the pow er they have, through philanthropic investments of every size, to make a difference on a grand scale. Early projections of what the campaign could raise suggested a goal of $150-175 million would be possible, but potentially a stretch. Based upon some early successes, the UNH Foundation board set an ambitious initial goal of $250 million when the campaign went public in 2016, then quickly increased that to $275 million. 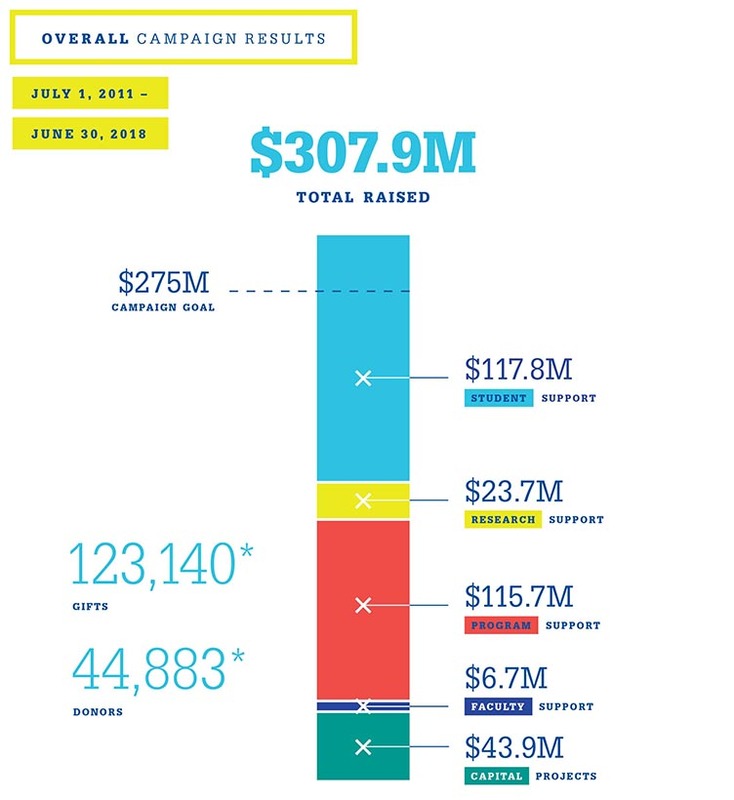 The campaign surpassed that number in October 2017, eight months before its close. The rest is history. A breakdown of the campaign results tells a story of how tens of thousands of individuals who believe in UNH came together not only to create this bright moment but also to light the way forward for UNH. 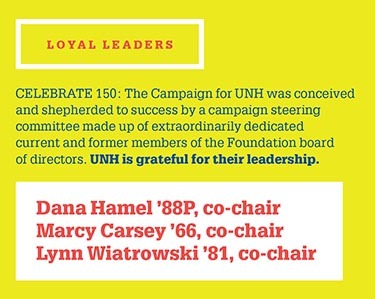 Within that story are countless others that demonstrate the lasting impact of CELEBRATE 150: The Campaign for UNH through the lives and work of students, faculty and staff members who have benefitted from such inspired generosity. Some of them are featured in the pages that follow. Thousands more are unfolding on our campuses every day. Thank you for believing in UNH’s mission and helping create a foundation of support to sustain the university into the future. Our entire community is stronger for what we have accomplished together through CELEBRATE 150. Tomorrow’s UNH will be bolder still. What lies beneath our past and future success remains the same: a fervent belief in the value of higher education. An uncommon commitment to our students’ success. A deep desire to make progress against pressing societal and environmental problems. There is still much work to be done. And working together, we will discover the power to create possibilities beyond what we can imagine today. Thank you for bringing us to the edge of possible.